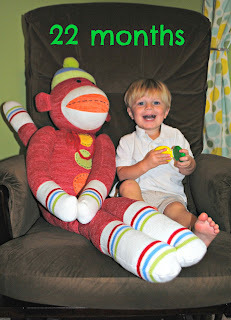 Moments with the Mays: G is 22 months old! G turned 22 months old yesterday! I am in complete denial that a) he only has a week left of being an only child & b) he is almost TWO YEARS OLD. Weight: 22.9 pounds...still a skinny little thing! Clothes: still in mostly 12 month shorts...he can wear some 18 month shorts if he has a belt:) Wearing mostly 24 month t-shirts & jon jons. Shoes: G had a huge foot growth spurt over the past month! He only wore size 6 shoes for TWO weeks before we needed to move up to a 7. I'm now afraid of the teenage years! We took away G's sleep sack over this month. He has been sleeping in a sleep sack since he was 3 weeks old so it was a little bit of a change. Luckily, Mr. Excellent Transitioner did just fine! I took him to the store to pick out 2 blankets, he chose a football blanket (typical) and an animal blanket, & he acted like it was no big deal when he went to sleep with a blanket instead of a sleep sack! Now, he rarely stays under the blanket & he now is back in footie pajamas because the pregnant mama keeps the house too cold for him. Ha! G has been really interested in the potty lately. We bought him a toddler seat to go on his toilet & he has asked to sit on it quite a few times. He has never done anything, but he tries. I am not pushing the whole potty training thing. I know it will happen when he is ready. I'm just glad we are to a point where he is asking about it & showing some interest! Grayson is obsessed with ALL things baby right now. He knows that something is going on, but he doesn't fully understand how his life is about to change. G loves going into the nursery & sitting in the bouncy seats and putting his Pooh Bear in the baby swing. He even asked to sit in Griffin's crib last week! We talk about baby Griffin all the time & he knows that he's in my belly right now. I am so curious about how G will react will he sees Griffin for the first time! We are still majorly into trucks right now. G watches truck videos on YouTube & has a big rig dvd he loves in the car. I swear I know more about trucks than any 27 year old girl should! G's newest interest is coloring. He loves to sit at his table and color & he asks me to draw baseball bats ALL the time. So random! He still loves stickers, too! Grayson's memory amazes me. He is such a sponge and never forgets things! We passed the fire station by our house one day & I told him that was the house that the fire trucks live in. Every time we pass it now he yells, "house," and then makes a siren sound. Crazy! milk -- go figure, he still hates it! He is also starting to say more simple sentences like "love you, Daddy" or "night night, mama." Grayson's personality is so much fun...especially now that he is talking so much more! I love this age...you know, aside from the tantrums & what not. He is learning new things constantly & is definitely showing a lot more independence lately. I am SO excited to watch him become a big brother. I know he will be a great one! 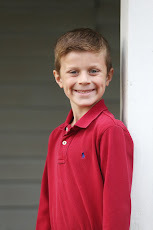 G has the sweetest little heart, best laugh, & a contagious smile...couldn't love him any more if I tried! He's such a happy little boy! You can see he's got personality like his momma! I can't believe you're gonna have another baby in a week!!!! OH ME OH ME OH ME!!!! SO excited for y'all!!!!!! Happy 22 months to him! :) He will be a great big brother, I am sure! Happy 22 months to G! He is getting so big & his little face expressions continue to give me sweet grins. He is just the cutest!